Voted by the industry as a Top 10 internet radio station of 2015, KGUP FM Emerge Radio is seeking to add 8 Artists to their roster to perform during live events in Summer/Fall 2016 in Los Angeles, CA in exchange for pay and promotion. KGUP FM Emerge Radio is now accepting submissions to select 8 up-and-coming Music Artists to perform during Summer/Fall 2016 on stage during one of four live events this coming Summer and Fall in Top venues in Los Angeles. (The specific dates are contingent on each venue location and Artist availability. Dates and locations will be disclosed to the public at a later time). - video production to prepare a visual presentation geared for investors to invest in making KGUP FM Emerge Radio a terrestrial FM station. - Compensation to artists: KGUP FM is committed to pay the 8 artists 15% of the net proceeds collected through the Kickstarter campaign as compensation for their live performance and promotional efforts. Unlike its competitors, KGUP FM pledges to not take advantage of independent artists' willingness to play for free in exchange for “exposure” and will NOT require artists to pre-sale tickets. KGUP FM wants to help eliminate this practice and set an example of what ‘community’ is by giving artists a share of what they collect. Once the Artist/band signs into agreement and joins the KGUP FM Emerge Radio team, the promotional period throughout all of 2016 will begin. During the campaign period between April through May 2016, the Artist/Band is required to promote the KGUP FM Kickstarter campaign as if it is their own in order to earn the percentage split. Artists represented by PR agencies and Management company’s must agree to the terms for this agreement to be valid. In turn, KGUP FM will promote all 8 artists throughout 2016 on all of KGUP FM’s social media including Facebook, Twitter, Instagram, Pinterest, Google+, and Reverbnation. 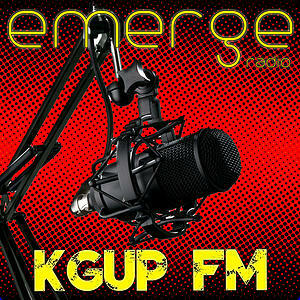 In addition, Artist/Band's music will be heard on rotation at KGUP FM Emerge Radio. All Artists will retain all copyrights, publishing rights, and royalties. KGUP FM simply wants to promote good artists in exchange for promoting a good radio station. - To share the KGUP FM vision and believe in what we're doing. The Artist/Band will reap the benefits of KGUP FM’s success, which relies on its artists and listeners. - Commit to helping KGUP FM promote its Kickstarter campaign coming this Spring.